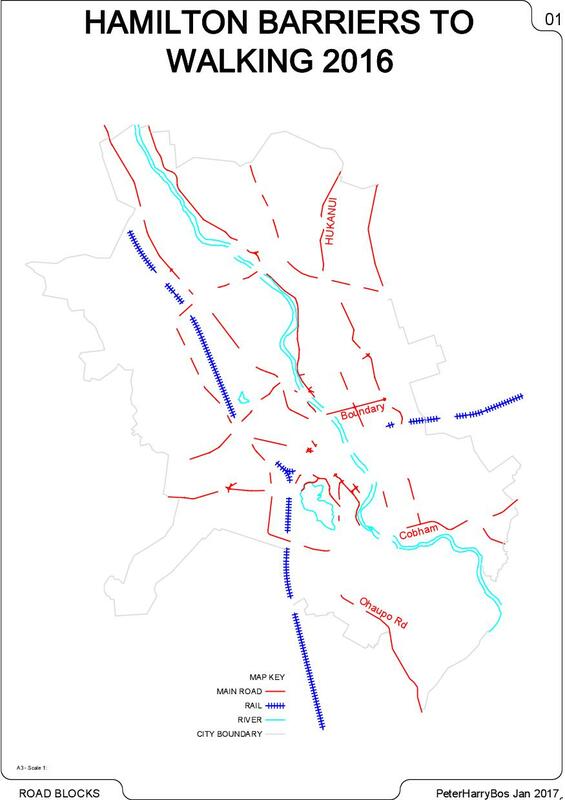 In the 2007 local council elections, Living Streets Hamilton and Cycle Action Waikato gave a flier to each of the candidates, which included a map showing long stretches of road with few safe crossing points for the average person choosing to walk or cycle. In the last 10 years lots of improvements have been made. The stand-out areas are along our urban State highways, Avalon Dr – Expressway path and Ohaupo Rd improvement moving to 8 to 80 year old standard. For Hamilton city council roads, the years of minor works projects have produced many small steps that combined result that will in time give change. However, Boundary Rd is one that keeps being missed from the safety improvements list and is becoming one of Hamilton’s most dehumanising city streets. 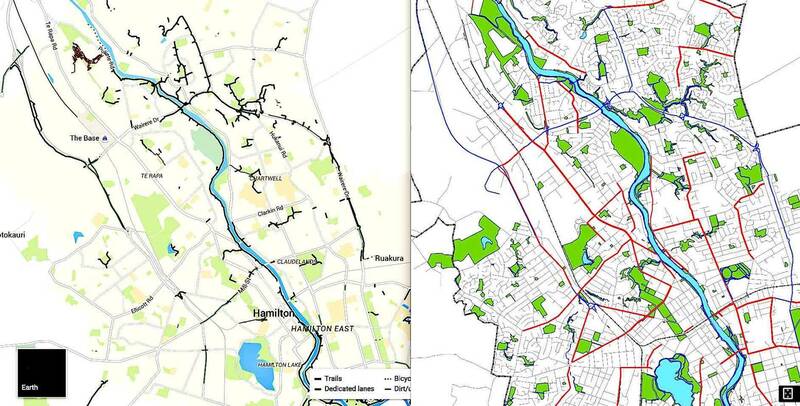 Walking/Biking infrastructure can be statically confusing if presented as total km of paths/lanes. A transport route is only as good as its weakest point. Should the cycle lane/path not began or end at a destination (like a school or a bus stop) or if the gap between the cycle lane end and restart does not feel or look safe (i.e. for the parent of an 8-year-old or in the informed opinion of a wise 80-year-old), only the fearless and the confident (a minority of about 8%) will be seen using it, excluding the majority of people who are interested in walking/biking but concerned about safety. So now that the 30-year-old athletic cyclists have options, let’s get on with connecting/creating a city in which both 8-year-olds and 80-year-olds can move about safely and enjoyably. For Google maps link, need to click bicycling in menu bar, the cycling symbol only works with route option. 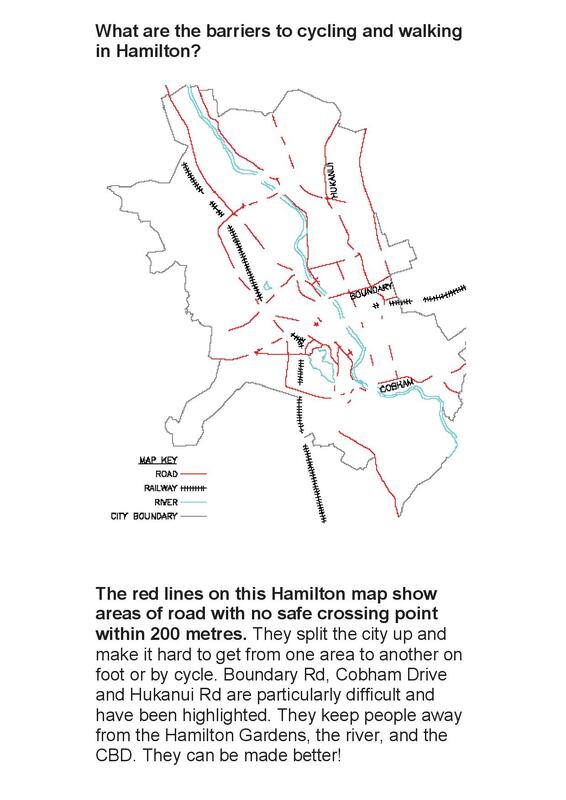 And here is link to updated Hamilton bike map, it’s pretty good with plenty of detail.